"LITTLE HOLLYWOOD WALK OF FAME." 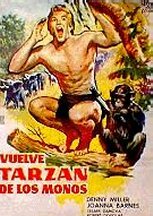 Those who are brave enough can see how they measure up in a Tarzan yell contest at 7 p.m. today at the Leonard Park pavilion. 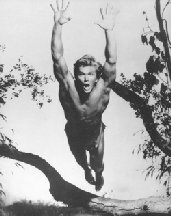 The event will be judged by Denny Miller, an actor who played Tarzan in 1959's "Tarzan the Ape Man." Just don't expect Miller to take part in the contest. It's not that he's lost his ability to do the yell, according to him, "I never had it. I sounded like a wounded yak." 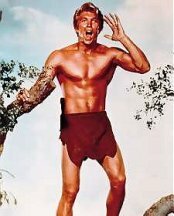 In a telephone interview on Wednesday, the affable and humorous Miller said the best ones he's ever heard do the yell were comedienne Carol Burnett, Tarzan writer Edgar Rice Burroughs' grandson Danton, and Tarzan actor Johnny Weismuller, who Miller said had the best yell of the 20 men who played the ape man. 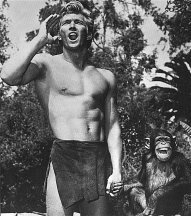 As for Miller, when he played Tarzan, he said the yell was done by a professional singer and then doctored. Miller holds an unusual distinction in that he is one of three men from Indiana to play the role. 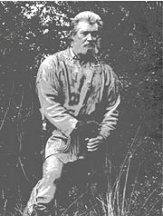 Elmo Lincoln was the first Tarzan. 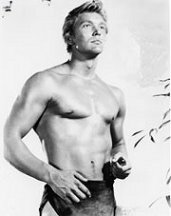 James Pierce went on to marry Edgar Rice Burrough's daughter (Joan) and they voiced Tarzan and Jane on the radio. It was a physically demanding role, Miller admitted, that's why it was played by men who had athletic backgrounds, like Weissmuller, who was an Olympic swimmer, and Miller, who grew up swimming and playing basketball in Indiana. Miller grew up in Bloomington, Ind., and his father, Dr. Ben Miller, taught physical education in schools, including Indiana University, as well as at home. 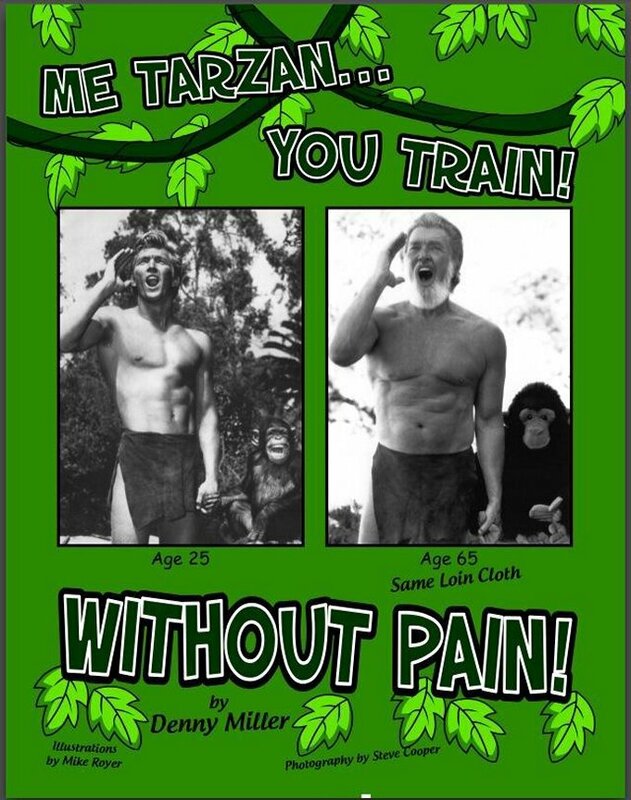 Young Denny learned his lessons well and still believes in exercise, so much so that he has written a book called "Toxic Waist? Get to Know Sweat" to motivate people, especially those over 65, to exercise. He dedicated it to his dad, who died about four years ago. The book has been written and is being illustrated. Miller said it should be out by Christmas. Miller had no plans to act in his younger years. He wanted to be a professional athlete, and even played basketball for the legendary coach John Wooten at UCLA. After he realized he wasn't good enough to crack the pros, he set his sights on a career in coaching. That all changed one day. He was working his summer job, moving furniture when an acting agent drove by and yelled at him. "Gave me his card, gave me a screen test and got a contract," Miller summarized. "Luck has a great deal to do with it." He was never the most sought-after actor, but he stayed employed. 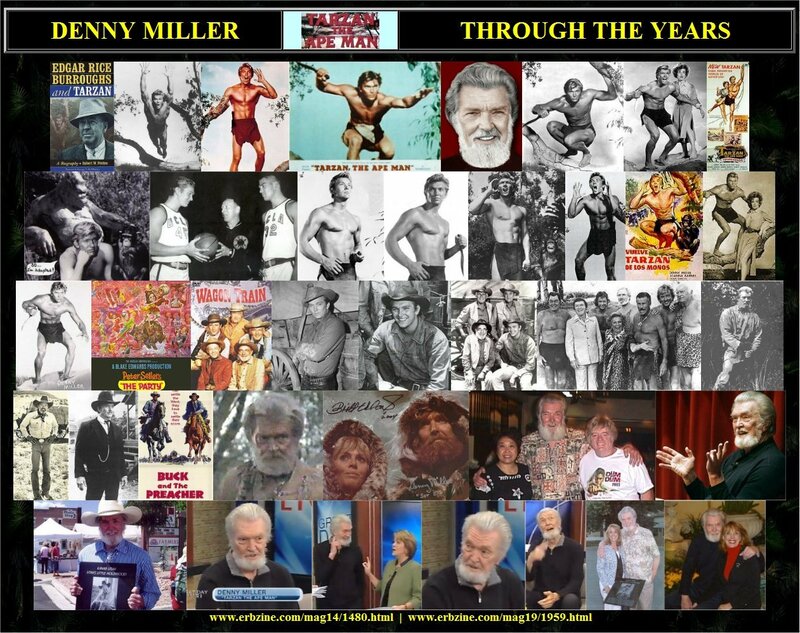 "I've really been fortunate with the variety of roles, good guys and bad guys," Miller said. He's also switched back and forth between movies and television. 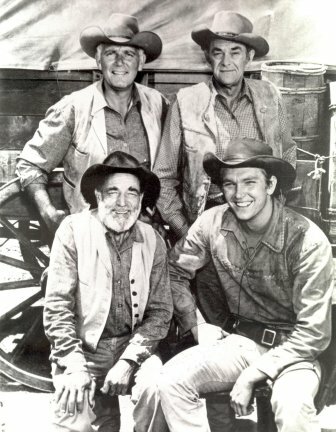 He thinks the roles most people would remember him for include the two guest appearances on "Gilligan's Island, which aired from 1964-67 - "It's never been off the air since," he said - his regular role as Duke Shannon on Wagon Train, and being the Gorton's Fisherman for 14 years, which put him on T.V. about 1,000 times a year. At 71, he recently retired from acting and another actor has taken over the role of the Gorton's Fisherman. 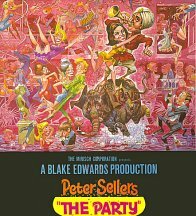 His favorite role was Wyoming Bill Kelso in "The Party" because he got to work with Peter Sellers. "It was 12 weeks of working with a comic genius," he said. "We didn't know what he was going to do," Miller said. The director would just let Sellers go and capture what Sellers did off his cuff and use it. "You knew something special was going on when actors and actresses who didn't even need to be there would stop by to watch," Miller said. When he guest starred on "The Incredible Hulk" as a recreation director trying to help the main character of "Bruce Banner" recover from paralysis, Miller said, "I got to say some rather important things." The woman who wrote the script for that episode received a writing award for it, he remembered. He worked with Lucille Ball and Bob Hope in some commercials and played Juliet Prowse's husband in the television series "Mona McCluskey" from 1965-66. "It was a dirty job, but somebody had to do it," he said. "I had a lot of fun." He had a good time guest starring on "The Brady Bunch" as an old friend of Carol Brady's, played by Florence Henderson. "Ten years is a long career (in acting)," Miller said, "and 47 is ridiculously long." 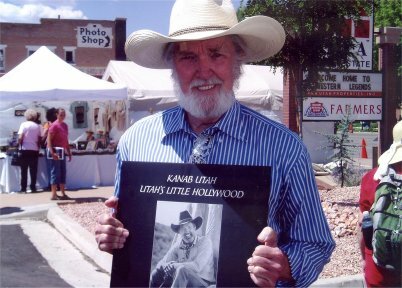 He's done more than 200 commercials and 19 or 20 films, including "Buck and the Preacher," "which was very nice," he said. 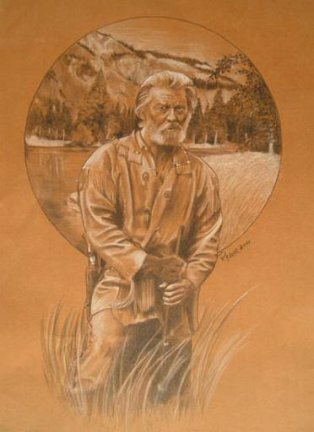 Miller enjoyed his stint as Sheriff Owen Kearney in the Canadian production "Lonesome Dove: The Series." "I was crushed when they shot me dead because I liked Calgary," he said. 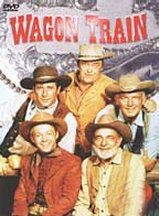 You may think you've seen him in one picture or another like "Wagon Train", only to look up the credits and find not "Denny Miller" but "Scott Miller" listed. The name change wasn't his idea. He thinks some producers just had nothing better do do one day, so they decided to change his name. When he protested, they told him, "We want you to have a name that doesn't end in 'y' because it's not macho enough." So Miller conceded, sort of. "I told them I wouldn't change my last name, but they had to make a list of acceptable first names and I'd have my parents pick one. They picked it the first time," he reasoned. As always, Miller is laid-back about the whole thing. "I answer to 'hey you,'" he said. But he did get the last word. "I changed it back as soon as I was not in the control of those producers," he admitted. He appreciates actors of this generation who are fighting the name changes forced on actors in the past, mentioning Arnold Schwarzenegger by name. Although he's technically retired, he has an autobiography out, the aptly titled, Didn't You Used To Be What's His Name? "I didn't decide (to write it), it wrote itself," Miller explained. "I woke up one morning, wrote three pages, giggled and watched over my shoulder for about 10 days," he said. "Eight months later, I had enough to put some pictures with it." He will be signing copies of the book from noon to 4 p.m. Saturday at StarrBooks in Gainesville. He and his wife, Nancy have been traveling extensively doing media interviews, but he tries to keep in touch with his children, Brad, a disc jockey in his early 40s, and Cortney, 32, who "married a nice guy" with Miller officiating the ceremony. He explained that in Santa Barbara County, where the wedding took place, you can get special authorization for about a week to officiate wedding ceremonies. "They asked me to, and I enjoyed it," he said. Right now, things are looking good. Cortney is expecting a baby around October. It will be Miller's first grandchild. His brother, Kent, has beaten non-Hodgkins lymphoma - "he was close to death three years ago," Miller admitted. 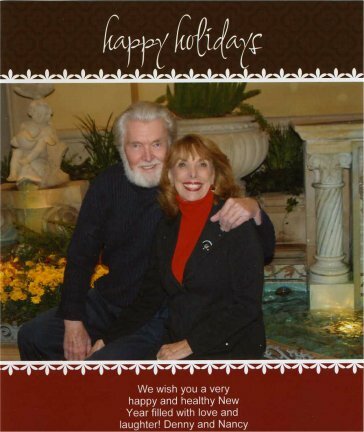 And his mother, Martha Miller, 94, is living in Ojai, Calif., and "doing well." As for himself, "I'm working harder than I ever have," Miller said enthusiastically. "We get to drive and see America." 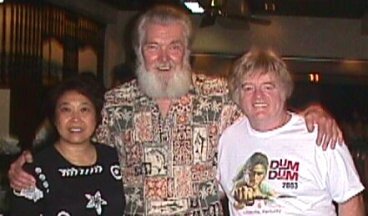 July 4, 2004 Denny Miller is fond of the aphorism, "Life is what happens to you when you're on your way to do something else." The Bloomington native wasn't thinking about much more than being a basketball player for John Wooden's UCLA Bruins and aiming toward a career in physical education when a talent scout stopped him on the street and asked to see his hairline. 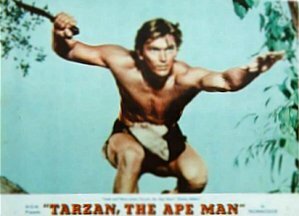 Months later, Miller would become Tarzan, star of Tarzan - The Ape Man, the 1959 film he jovially calls the worst Tarzan movie ever made until Bo Derek and her husband, John, took a swing at the venerable character in 1981. "I was a misplaced basketball player and I was frightened to death by what I was doing," he confessed recently. 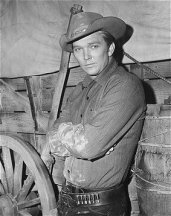 But Miller continued in acting and carved out an enviable career as a character actor, ranging from a regular role as scout Duke Shannon in the television series "Wagon Train" on through numerous movie, television and commercial roles. For the past 14-plus years, he's been the Gorton's Fisherman with a visage so recognizable the company changed its logo to resemble the ruggedly handsome, bearded actor who first greeted the world at Bloomington Hospital 70 years ago. The affable Hoosier wrote his memoirs recently and with characteristic humility titled the autobiography, Didn't You Used To Be What's His Name? "I've always appreciated my life and my career but I don't think I ever really appreciated things enough until I sat down and actually read what I wrote and thought, 'My God, look at how lucky you are!'" he marveled. Miller was fortunate enough to have director George Cukor give him his first screen test - and his first acting lesson. And to have Cukor take him to dinner at the home of a fellow Hoosier, Cole Porter, who regaled him with the theories on the origin of the Hoosier moniker. 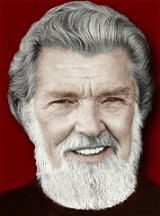 He was lucky enough to work with or get to know a dazzling array of actors, including Katherine Hepburn, Bette Davis, Juliet Prouse, Charles Bronson, Sidney Poitier, Jack Lord, Peter Sellers, Bob Hope, Lucille Ball and many, many more. They're all in the book, along with other anecdotes that make one marvel at how many stories can come out of a life well-lived. Like the time during a UCLA/North Carolina alumni basketball game when Miller, the oldest man on the floor, found himself as the only defender against a fast break led by Michael Jordan and James Worthy. "I cupped my hands and yelled to the thousands (in attendance) - HELP!" Miller writes. Didn't You Used To Be What's His Name? is written in a casual, folksy style that doesn't pretend to be anything more than the memoirs of a man who's led what might be called a quietly extraordinary life. When Waldron High School won the 2004 1A Indiana High School basketball championship, Miller squeezed in a chapter to point out some fascinating coincidences, including the fact that his father, Ben, and his identical twin, Len, led Waldron to the 1927 state finals and another set of identical twins led the 2004 team to its title. Ben and Len Miller played for coach Branch McCracken at Indiana University and played against Wooden, the Purdue player who would become Denny's eventual coach and mentor. And at UCLA, Miller's teammates included future Louisville coach Denny Crum and Olympic decathlete Rafer Johnson. 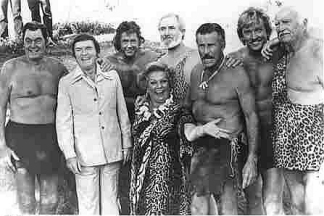 Still, it's the Tarzan connection that seems to have the most staying power. "They say there are four fictional characters known 'round the world - Batman, Superman, Mickey Mouse and Tarzan," Miller said. There have been 20 different Tarzans and three have hailed from the Hoosier state: Elmo Lincoln from the silent film days; James Pierce, from Freedom in Owen County; and Miller. 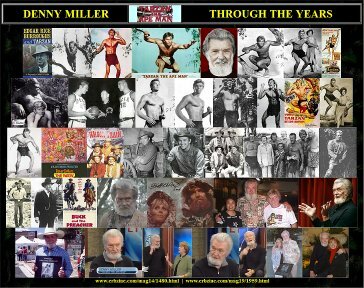 "It was a real honor to play Tarzan, because he was one of the good guys," said Miller, who played a lot of bad guys over the course of his career. "He was an environmentalist before that word was even known. He was kind of a cross between Dr. Doolittle and an Olympic athlete. 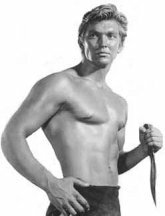 And a few Tarzans were, in fact, Olympic gold medal winners, including Johnny Weissmuller, Buster Crabbe and Glenn Morris." Despite the fact that a great many athletes prove to be terrible actors, Miller sees a strong link between acting and sports. "They're both team sports, actually. Even if you're doing a monologue and the guy on the spotlight isn't with you, you're in the dark," he explained. "There are stars in a movie or a play and there are stars on a basketball team and supporting players," Miller said. "The coach is the director." Being athletic and handsome always helped Miller, and for good genes and good values, he thanks his father, Ben, who became an IU faculty member and, later, the chairman of the physical education department at UCLA and president of the American Academy of Physical Education. "He spent a great deal of his time trying to justify his field of study to academia," Miller said. The veteran actor continues to be an avid proponent of physical fitness and he complains, passionately, that "We've become the fattest and most overweight nation in the world and it costs our country dearly in dollars and unfulfilled lives." He's also become an ardent spokesman for mental health after inexplicably being stricken with bouts of depression rather late in life. "They say that there are 6 million men out there right now who suffer from depression and will not seek help," Miller said. "At every opportunity I get, I urge people to seek help. It's not a weakness. It's a chemical imbalance in most cases. I'm just so grateful that mine is under control." 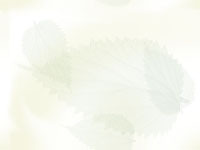 The author hopes to come through his home town on a book tour this fall. A trip to the area seems logical, he said, especially given that a close associate is George T. McWhorter, curator of the Edward Rice Burroughs (Tarzan creator) Memorial Collection at the University of Louisville, KY.
UCLA basketball coach John Wooden in a 1958 photo. 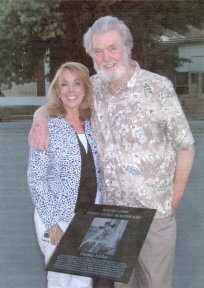 You may not know Denny Miller by name, but you probably know his face -- especially if you like fish sticks. He was the fisherman on the front of the Gorton's box until 2004. 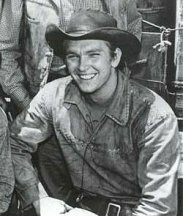 He also was Duke Shannon on "Wagon Train." 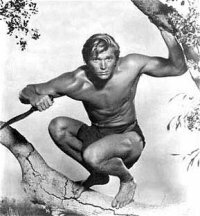 Before that, he was the 12th Tarzan of the 21 who have swung from a vine in the movies or on TV, having starred in the 1959 MGM remake of "Tarzan, the Ape Man." 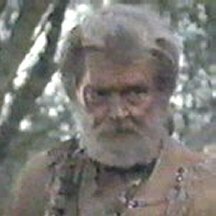 The worst Tarzan movie of all time says the self-deprecating Miller, 76. At least until the one with Bo Derek came along. Those credits alone would make Miller darn near one of the most fascinating Las Vegans you'd ever hope to meet. Throw in his guest-starring roles on "Gilligan's Island" and "Gunsmoke" and that he was a starting guard for the great John Wooden at UCLA, and Mayor Oscar Goodman and Carrot Top suddenly have some serious company. Like the rest of the sporting world, Miller was deeply saddened by the June 4 death of his genteel former coach and molder of men. 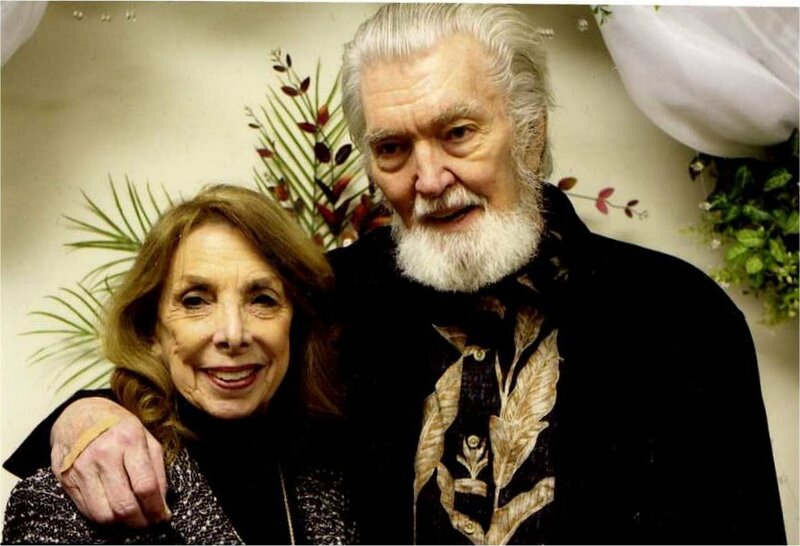 "He was a poet in the locker room, and I don't mean he recited poetry," said Miller, who moved to Southern Nevada with his wife, Nancy, nine years ago and uses Tarzan's famous ululating yell on his answering machine. "He was a soft-spoken gentleman in a macho world." Miller's younger brother, Kent, also played for Wooden. Their father had competed against the legendary Bruins coach in high school in Indiana and later joined Wooden on the UCLA faculty. 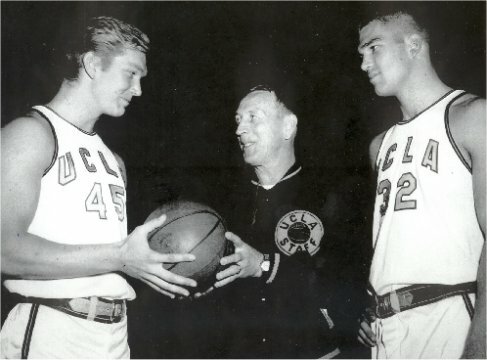 Denny Miller's UCLA teammates included Willie Naulls and Rafer Johnson, the famous decathlete. When Miller quit the Bruins during his senior year to become Tarzan No. 12, his roster spot was taken by Denny Crum. Miller recently wrote a book called "Didn't You Used to Be ..." which was the last time he corresponded with Wooden. The coach sent him a photo and his famous "Pyramid of Success" for use with the memoir. "The world is a far better place for John Wooden having called it home for 99 years," Miller said. is out in a boxed set of 3 discs, 12 episodes. at $40.00 per set, plus $6.00 U.S. shipping. Terry Wilson and Frank McGrath in recurring roles. Leonard Nimoy, Dennis Hopper and many other Hollywood greats. the highest quality reproduction in picture and sound. Interactive Menus and Episode Selection. stating your name, address, city, state and zip code. $120.00 FOR THIS SPECIAL EDITION. A message from Nancy Miller: I want to thank you for the lovely tribute you posted about Denny. I thank all of you for your kind emails and posts. I will begin to respond to each of you soon. 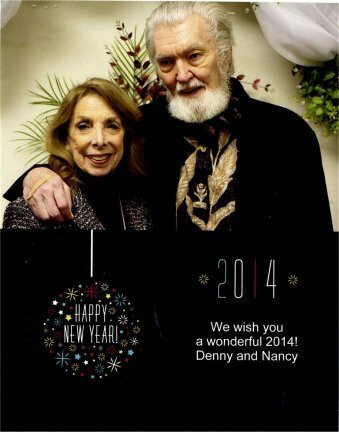 Denny was diagnosed with ALS in January. He chose to deal with this horrible disease like he had lived his life - privately, with grace and dignity. So little is really known about ALS and there is no cure. The recent Bucket Challenge has been amazing; raising a huge amount of money for research and public awareness. The Challenge is another example of the impressive social conciseness of so many! Denny was a student athlete, TARZAN, Duke Shannon, Wild Bill Kelso, The Trusted Fisherman, and so much more. He was a gentleman and a gentle man! However we choose to remember him, he will live on in our hearts. Some ERB Text, ERB Images and Tarzan® are ©Edgar Rice Burroughs, Inc.- All Rights Reserved.